Are you a movie lover who enjoys watching some of the best movies along with a huge DVD movie collection? Are you called the DVD Terminator because you often scratch and damage the movie DVDs soon after buying them? Have you ever spent hours to find the DVD backups, because you've accidentally damaged those disks way too much? If you're own a DVD collection, then you must be relying on some DVD copy software that can copy and clone any DVD to an ISO image, VIDEO_TS folders, blank DVDs or can customize DVD copy mode like copying the main movie only, with audios, videos, individual chapters, etc. Instead of searching aimlessly like a frustrated bull, you're suggested to read this post on some of the best DVD copy software programs you could find online. You can also download the free trial versions of these DVD Copy Software available for Windows 10, 8, 7, etc. So here we are with reviews of the top 5 free DVD copy software for PC you can download easily. You can use this DVD copy software to clone a broad range of home-made, copy-protected video DVDs, DVD folders, ISO image files from DVDs as well. The software widely supports different outputs like the DVD folder, DVD ISO images file, DVD+R/RW, DVD-R/RW, DVD+R DL and the professional DVD-R DL. 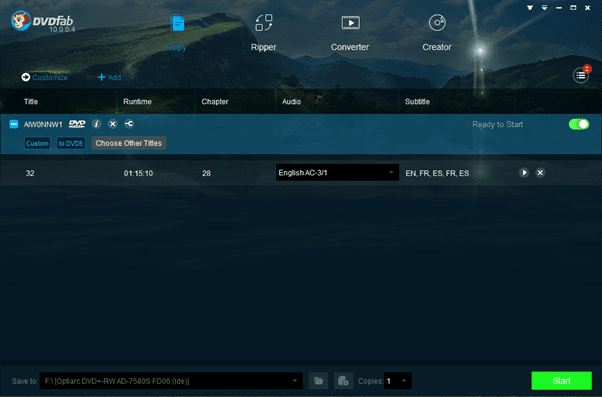 DVDFab is the best and the top program that hosts a bundle of features like the DVD copy, a DVD ripper, DVD converter and creator. You are entitled to clone a full disc or a movie to multiple blank DVDs, hard drive or any external storage device. 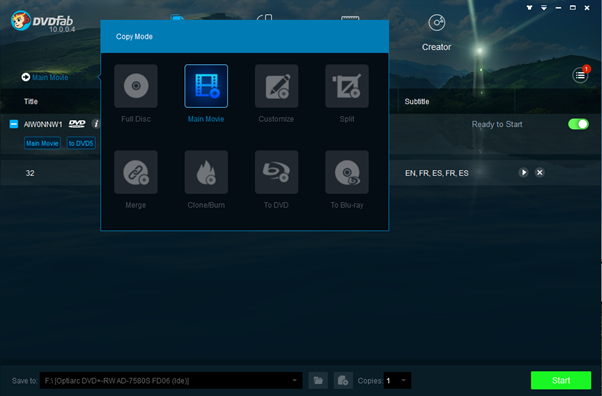 DVDFab also enables you to customize the DVD copying and splitting DVD 9 to DVD 5. You can merge multiple DVDs into one DVD by a very simple feature. This powerful DVD copy software is without any doubt, a premium one and the DVDFab is priced for $49. However, the company offers the free version for all the users to get a hint of what this program is accomplished. The UI of DVDFab is best I've ever seen or used so far. Despite being a DVD copy tool, the company has also focused on creating a beautiful interface with all the blues, and a slick modern look. However, it is a performance beast and processes all the copy tasks in a fast manner. Supported input: standard home-made and encrypted DVD discs, VIDEO_TS folders, and ISO file images. Supported Output: The DVD discs, DVD folders, ISO file, a DVD media file, DVD±R/RW. The DVD Cloner also provides DVD copy service and has been in the market for a long time. 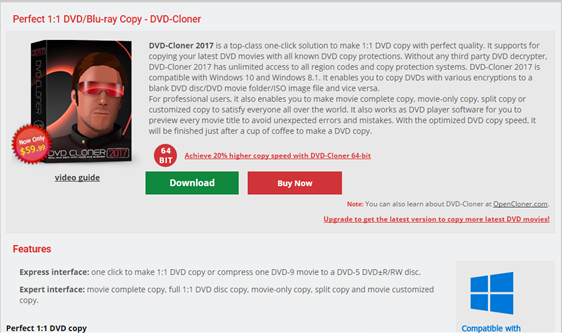 The latest generation software allows the users to copy the most recent DVD movies including 1:1 DVD copy, the movie only copy and customized copy. The most eye-catching feature of DVD Cloner is to combine multiple DVDs into one DVD±R DL, and BD-R/RE. Just like the DVDFab, it can finish a DVD movie copy within minutes. The software is competitively priced for $59.99. Apart from the standard software, the company also offers a Platinum version that sports a DVD Copy and the Conversion software, all for $79.99. The best thing about Aimersoft DVD Copy is the quality of new discs it produces. If you want to build an exact copy of a DVD, you'll have to use the larger-capacity blank DVD-9s. Aimersoft creates an identical duplicate of the DVD with no quality loss. The software is priced at $29.95, and that's why it is the cheapest and affordable in the list. You can also go for the free version of the software from the official Aimersoft website. When you squeeze a larger disc to fit onto a smaller one, you'll notice some quality loss in the new DVD. The feature applies to every product in our line-up. After testing with multiple DVDs, we examined the quality of each DVD that was compressed. Aimersoft DVD Copy performs much better than most of the products concerning quality. With a little bit of minor pixelation and compression artifact in the picture, the software works fine. CONS – Unlike over contenders so far, Aimersoft DVD Copy sadly misses some tools, like Disc splitting into two and disc merging into one. Apart from the standard iPhone and Mac application software, Xilisoft is also dominating the market with its DVD Copy program. My first impressions of this software are that it's very easy to use and copy DVDs. The entire interface is compiled into one screen that contains all the available features, and tools. Within a single click, you can start copying the DVD files and videos by just loading the original on into the software. Most of the retail DVDs are encrypted to protect the content from illegal piracy. Therefore, they also prevent you from making personal copies of the movies you've paid for. The program smartly bypasses the protections using its smart decryption and allows you to copy and customize the DVD media into multiple output purposes. On an average, this software consumes about 35-45 minutes of your time to copy a DVD onto your hard drive or a blank DVD. It is true for exact copying, compression or customization of any disc that you're cloning. It was pretty similar to all the other tools that we've reviewed so far. With 1:1 Copy ratio, DVD movie copy, and many other incredible features, the Xilisoft Copy 2 software is priced for $39.95. However, currently, it's available for a discounted price. You can use the software for both Windows and Mac powered devices. And last but not the least, the 123 Copy DVD is yet again a renowned software. It offers all the basic and advanced copying and cloning features. However, it also requires you to download and install a plugin for decryption before it can copy these DVDs. Don't worry as the program automatically directs you to the steps and location. After the process is done, you can then make new copies of all your DVDs. The software is known to make the exact versions of the DVD that you are copying. I don't know why but it takes an unusually long time with this software. However, the output quality is not bad. If you're on a disc compression spree and want to copy multiple disks, then this software would surely consume your whole day. The 123 DVD Copy easily allows you to fit a smaller-capacity blank disc but that too in half an hour. So, if you're looking to copy quick, then go for the compression feature. The software is priced at $49.99 and offers a video downloader extension with the premium version. You can download the free version to get a trial of what this software is capable of. An array of distinct features offered at a reasonable price. The program allows you to save a DVD's ISO file to your local hard drive. You can also try the ISO file to watch the DVD media on your PC without the DVD or any Blu-Ray Player. Moreover, you can copy the videos, audios and the movie using this tool. It is an easy way to archive your digital library collection with all your favorite films.